Fucked Up play so many gigs in weird spaces around the city, playing in an actual club might be the most the novel thing the Toronto punks could do. Nevertheless, they managed to outdo themselves on this night, headlining Lower Bay Station, a ghost subway stop often used for location shooting deep underneath Toronto's tony Yorkville neighbourhood. Playing their first gig together in over a year, the band sounded hungry, and lead singer Damian Abraham wasted no time exploring the space set out for the 100-plus fans who'd managed to snag tickets. Set up on the station platform, Abraham quickly obliterated the line between musician and spectator, repeatedly wading into the crowd, taking a stroll through one of the two open subways flanking the band, or perching on the side of the PA system, thrusting the mic into the screaming mouths of the audience. Abraham mentioned a new album, masterminded by Mike Haliechuk — "I'm not even on every song — it's crazy good!" — while knocking out classics like "David Comes to Life," "I Hate Summer" and a blistering version of "Son of the Father." Despite the controlled chaos, they even made room to bring out DIANA's Joseph Shabason on saxophone. 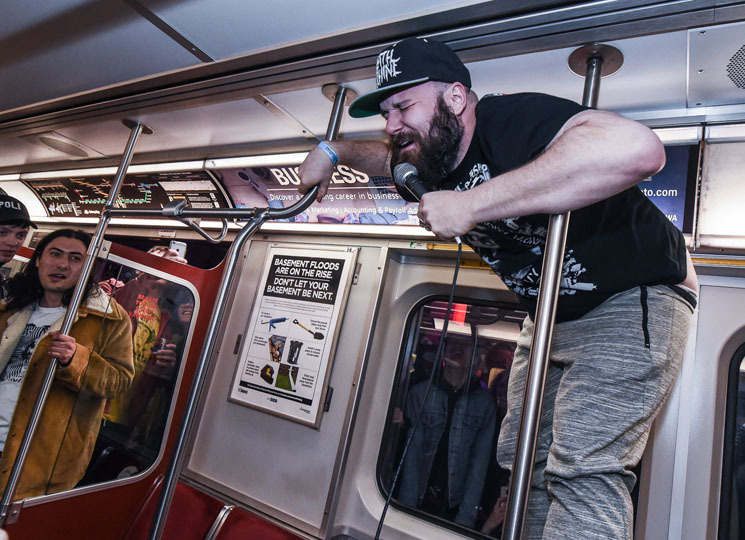 It was all red meat to the crowd, a mix of fans, media, politicians and even some curious TTC employees who couldn't help but be swept up in the band's enthusiastic sonic assault.